Technology has been able to take us to places that we would never have been able to imagine. I remember back in the day when I had a pager, better known as a beeper. And that was only as recent as around 1993-ish. 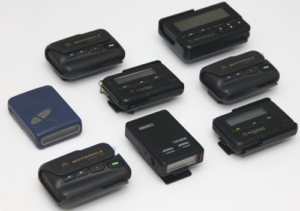 In order to page someone you simply had to dial the beeper’s number and input a phone number for the person to call you back. As the beeping world progressed people would assign special numbers to people in order to know who was beeping you. Then, of course, you would also get a code for how urgent the call was. An example would be something like this: 331-8898 15 611. The first number would be the callback number and 15 would be an unofficial number assigned to someone. The 611 would indicate that it’s not super urgent, but a little more urgent than normal. The urgency code was based on 911 being the most urgent and 111 being the least. This system lasted a few years. Then came the bag cell phone. Only the rich people had a bag cell phone. It was difficult to look very cool toting around a huge black bag that looked like you were carrying around the nuclear blast codes. I think maybe one friend’s dad had one of these big ol’ phones. Whether you looked cool or not was immaterial, because you were most likely one of the few people to roll around with one. Also in this timeframe, some people had car phones. This phone was attached to the car’s stereo deck and I think it drew its power from the car stereo as well. 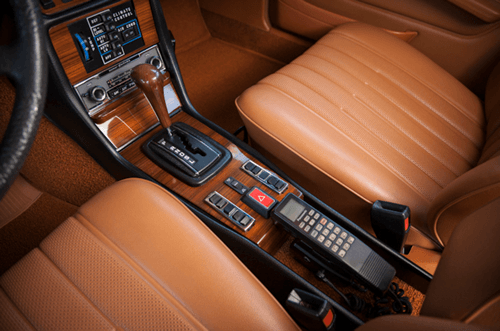 This phone’s design was pretty cool because it was mounted down on your right in the center console, or in front of you near the radio. The keypad was on what would be the top, or what may be considered the back of the phone, so it was easy to dial with your thumb. I literally only knew one of my friend’s parents that had one of these in their cars. He was a state assemblyman at the time. These phones were few and far between, at least in my life. It was also pretty expensive to make calls from. Moving along the timeline of technological advancements the next phone I remember, was the big brick phone. Literally, the only person I knew that had this phone was Zack Morris from “Saved By The Bell”. This was a huge bagless phone that literally looked very similar to having a brick in your hand. Hence, the common name for it was the brick phone. 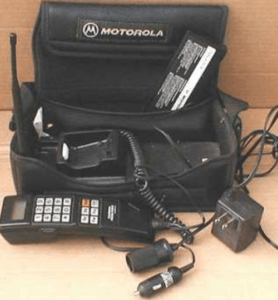 Motorola was the largest brand name I remember that made the brick phones. A bit later along the tech timeline, the Motorola StarTAC series came along. It was at this time that I came along on the scene. 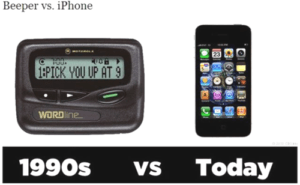 Up until this point, I was still rocking the pager/beeper, but I was in my late teens or early 20s by this time and it was due time to have a cell phone in hand. 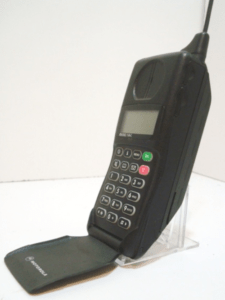 The StarTAC was the first clamshell phone and completely analog and was released in 1996. 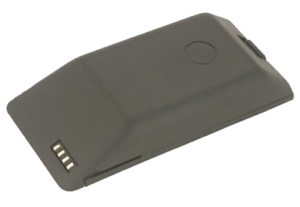 The battery was removable from the back so it was easy to switch batteries if needed. It was very common to have two batteries with you almost all the time. Just think about it, this phone was completely analog and all you could do was talk with your cell phone. That’s it. You could talk on it. There was no internet surfing yet at this point on your phone. It was a dark time in comparison to today’s abilities of phones. It would not be until 2010 that the modern day smartphone that we recognize today would be released by Apple. However, before the time of the iPhone there was actually a “smartphone” made by Ericsson it was the Symbian phone. 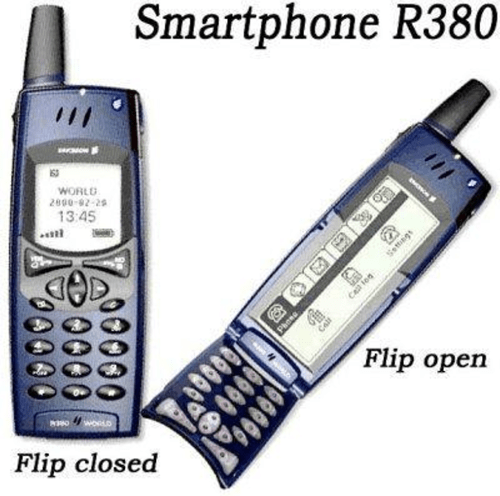 It was a touchscreen Ericsson R380 Smartphone, it was released in 2000 and was the first device marketed as a “smartphone”. It combined a PDA with a mobile phone. 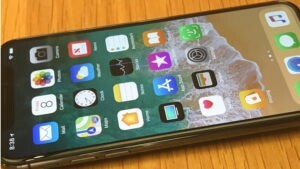 Apple made the first large market smartphone when they launched the first generation of the iPhone. However, people were using the term “smartphone” since 1995, but the first true smartphone actually made its debut three years earlier in 1992. It was called the Simon Personal Communicator, and it was created by IBM more than 15 years before Apple released the iPhone. 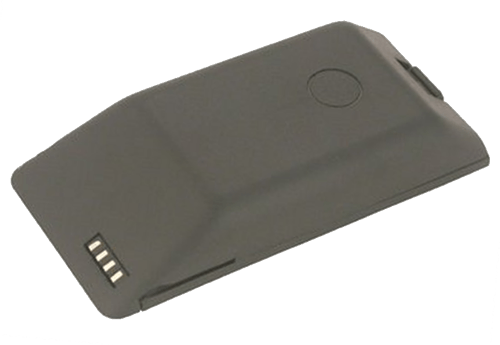 Most people today are familiar with what we know as a modern day smartphone. The Apple and the Android devices are so much more than we could have ever imagined back in the 90s. Today we are able to have almost any piece of knowledge that you could ever desire at the tip of our fingers. Being able to navigate the web within seconds is an amazing feature that a lot of people never knew didn’t exist. Though today we have incredible devices by yester-decade’s standards, man, don’t these phones come with a hefty price tag? Sometimes the mere price itself is enough to turn you away. Luckily, we live in a time of eBay and Amazon where you can sell your older devices electronic devices (or pretty much anything else). 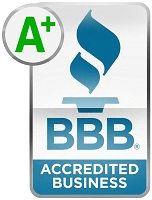 If selling your electronic devices online isn’t your thing, or you don’t know how it’s nice to know that there are reputable companies that buy back your used or broken devices. Check out www.SellBroke.com / www.SellLaptopBack.com. These companies really make selling laptops and other devices easy and profitable.